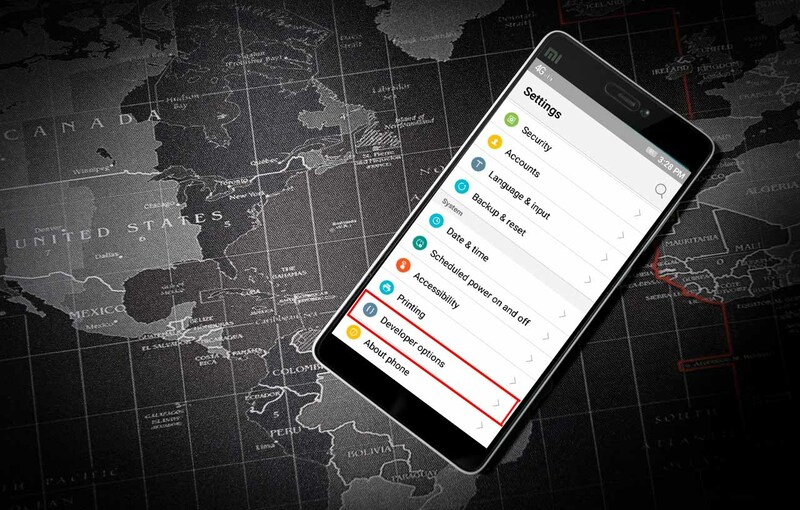 To access any of these cool options, you’ll need to unlock the hidden Developer options menu on your android device. Just head over to the main Settings, then tap on About phone, About device or About tablet. Here, tap on “Build number” for 7 times continuously, then you’ll get pop up a message informing you that the Developer options menu has been enabled. 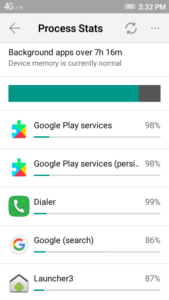 Process Stats is useful Developer options When you on tap this, you’ll see an interface that’s similar to Android’s battery status on your device. 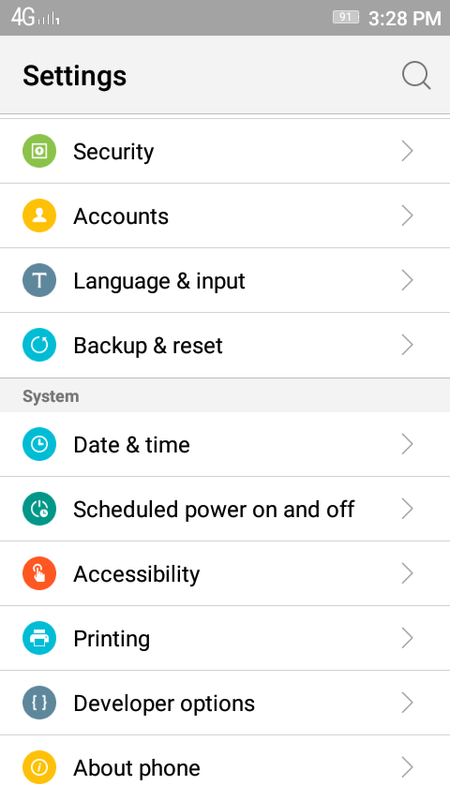 this Developer option gives you details about how much RAM your device will use. The bar graph at the top of the screen tells you How much percentage of RAM is currently in use for that particular app, and the list is in descending order from the graph you have a look for which apps are using more RAM. 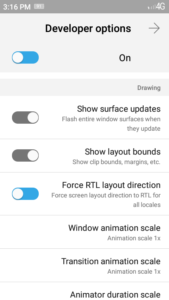 Force RTL Layout is another cool Developer option, which is very useful and a fun way to experience your phone in a new manner, it can be quite helpful for left-handed users. The Toggles will change from right to left and the orientation of all elements on your screen will switch over to an RTL, or right-to-left, layout. Text formatting will be same defined by your regular system language so that you can read everything on your screen. 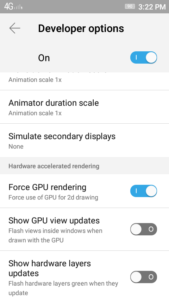 The next developer option in our android phone is actually a set of options which adjust the speed of transition animations. “Window animation scale” affects the speed of animation transition that takes place whenever you switching between any options. And the second option is “Transition animation scale” which affects the animation switching between apps. 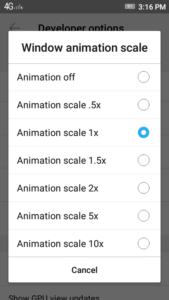 Third similar option, “Animator duration scale,” only affects certain loading animations. 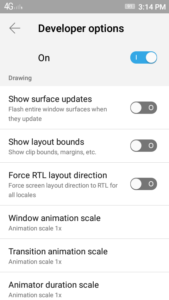 If you’d like to speed up the animations on your android, set these options to lower than 1x, so that your phone speed will increase instantly. If you want longer animation then set those options to more than 1x. This next option quite helpful for experiencing high graphics in some apps and games. 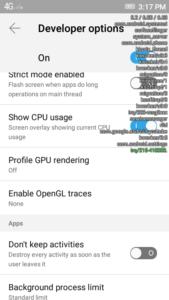 If you are struggling with low graphics on your Android phone with version 4.0, Now Android uses your device’s dedicated graphics processor to render two-dimensional objects by default. Some of the apps haven’t been updated to use the advantage of this faster rendering graphics. 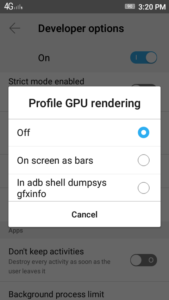 However, if you have any apps and games whose graphics seem to be rendering slower than other apps and games, enable the “Force GPU rendering” option. 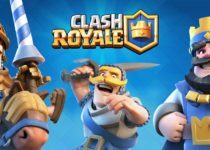 This will make your Android apps use the advantage of Android’s hardware graphics feature, You will experience smoother than before. This next Developer option will make you wondered. have you seen behind the scenes on your Android device? Then Enable the “Show CPU usage” option, then you’ll instantly see an overlay on your top right side screen that shows you all of the processes that are running in the background. This information is ordered by the current CPU performance, and it will show you the overall processor usage at the top of the screen. 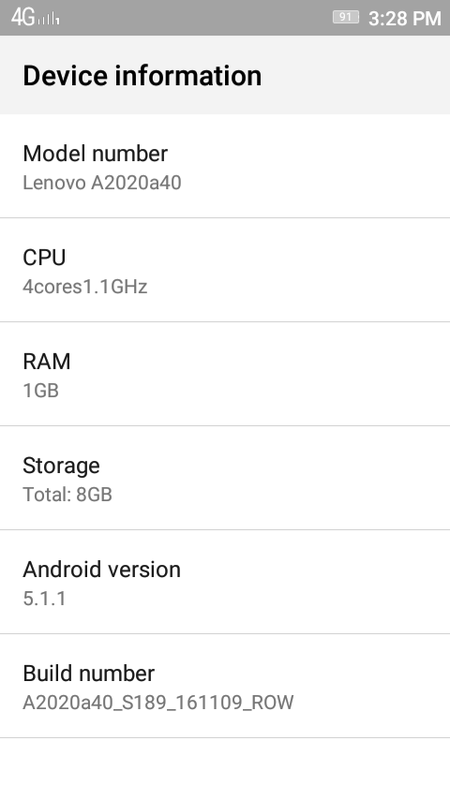 You don’t have much RAM on your Android device. 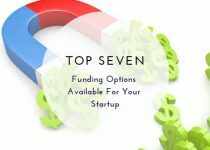 If you might want to look into this last option. 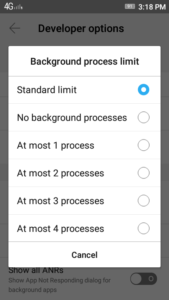 Select “Limit background processes” option. then you can choose the number of processes that are allowed to run in the background. For instance, you select this “At most 3 processes” then you can run the current app and the two other recently running in the background processes will allow, which will make free space to perform the background processes. 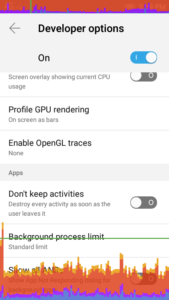 If you’d like to test your device’s graphics performance, select the “GPU rendering profile” option and set it to “Show on screen as bars.” This can be a very useful way of comparing the graphics performance for different apps on your device since the overlay will be shown on top of all screens. The condensed graph at the top of your screen shows recent graphics performance history, while the bars across the bottom of your screen depict graphics performance on the fly. whenever the graph gets high spikes mean there was a heavy GPU load at that moment, so in this way, you can see if an app is dropping frames or performing poorly graphics. 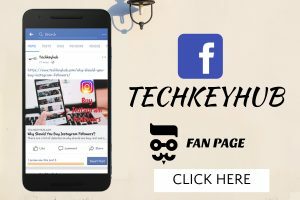 I hope this article is helpful for you and if you have any queries or wanted to know any new things, updates and features about Android or Latest Technology please let us know and gives your valuable comments.